My rating: 8/10. Good watch. Value for money skeletonised watch design. Hello, today I’m doing a Rotary GS00160/02 review. 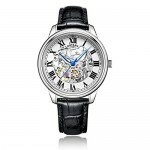 I recently wrote an article on the 10 best Rotary Skeleton watches for men and decided I would feature some more of Rotary’s awesome automatic watches. I hope you enjoy this Rotary GS00160/02 review below. 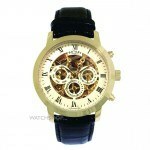 You may also like my: Best Rotary Watches. This rotary watch isn’t as popular as some of the other models I’ve featured this month, and it’s fair to say we’ve looked at most the skeleton series. With a more monchrome, plain finish it’s a little too, boring in my eyes. Don’t get me wrong, I love the open heart exposed movement with the jewelled movement for that tiny bit of colour, but I’d always pick one of the other models other this option. I could see it working if you’re trying to fit it to match up with a suit perhaps, but that’s about it for me. The casing is made of a tarnish resistant stainless steel. Around this price level I often expect to find mineral crystal glass, and that’s exactly what this watch features, protecting the front and rear of the watch. This mineral glass is specially treated to make it harder, offering a higher level of scratch resistane. It also has a good level of protection from shattering and knocks. Rotary have always been pretty good with their choice of movements. 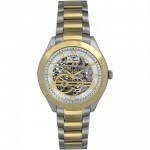 In this watch they have a lovely jewelled automatic self-winding movement that’s ideal for this style of skeleton watch. Automatic movements don’t require any batteries as they’re charged by the movement of the wearer’s wrist. As for the sizing of the watch, well, it’s all pretty standard, a men’s medium-large watch. The casing diameter measures 40mm whilst the thickness is around 12mm. I’d say this would be suitable for most men to be honest. The strap is made of a black genuine leather. It’s soft and comfortable and fastens with a buckle style clasp. With a width of 20mm it’s in-keeping with the casing size. 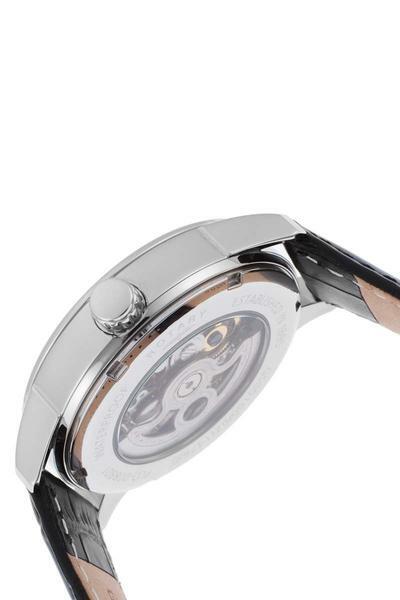 A key extra feature of this watch is the exhibition caseback. This gives you the ability to see the automatic movement from the rear of the watch, something I really enjoy taking a look at. There’s an image below so you can get an idea of what this is like. This watch has a water resist rating of 100m. A rating of 100m / 10 Bar makes this watch suitable for recreational surfing, swimming, snorkeling, sailing and water sports. Band Genuine leather strap, standard length, 20mm width, buckle style clasp. Case Stainless steel casing, sizing diameter: 40mm and thickness: 12mm. Movement Accurate Japanese jewelled automatic movement. If left unworn for more than a day or so the watch will need to be reset and the time adjusted before wearing again. This is a standard process for automatic watches. The Rotary GS00160/02 is a little blander then some of the Rotary watches we’ve had featured from earlier on in the month. Personally I’d pick one of the other more colourful options over this timepiece. 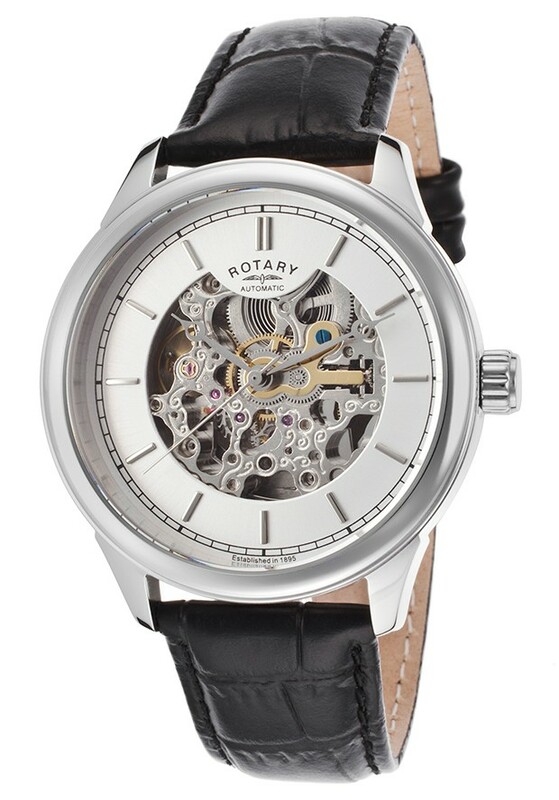 That being said, if you want a professional looking Rotary watch to match up with a suit, then this could be ideal. Hope you enjoyed this Rotary GS00160/02 review. Find more watch reviews below.